Alternate perspective: Obama is only three years older than Eddie Vedder and Chris Cornell. Both sound like Saturday Night Live sketches. I dug the one episode of John Mayer Has a TV Show that aired on VH1, though. Meanwhile: Brian McKnight will be a contestant on The Celebrity Apprentice 2. "If ever I believe my career is through, then I'll star on Celebrity Apprentice 2!" At Subway today, the man behind me ordered a tuna salad salad. Like, a salad with scoops of tuna salad on top. In Vegas, my boss dragged me to Lawry's. I'm not a vegetarian by any means, but I would rather a woman menstruate in my mouth than eat prime rib. Steaks are obscene. Steakhouses are obscene. I hate admitting this because I hate agreeing with you, but yes, that cut is disgusting. It's like 4 large portions of beef that could have fed 4 normal people, combined to make this Voltron gestalt of moo-cow. I also agree with you entirely on the steak/steakhouse issue. My dad's a big steak dude, took me to the "best" chophouse in Chicago… and I ordered swordfish. Awkward moments in history! Sounds like you're the type of guys that order meat well-done. 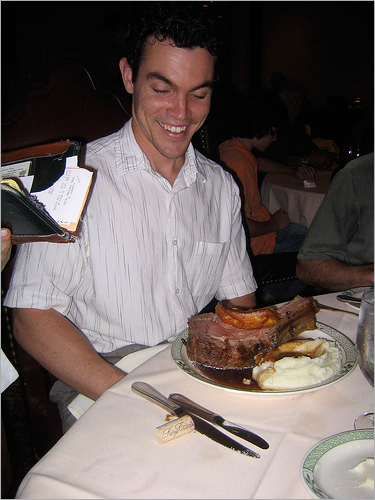 You clearly know going into a Lawry's what you're in for – a gaudy piece of ridiculous meat. Human up, dive in and chew with your mouth open.